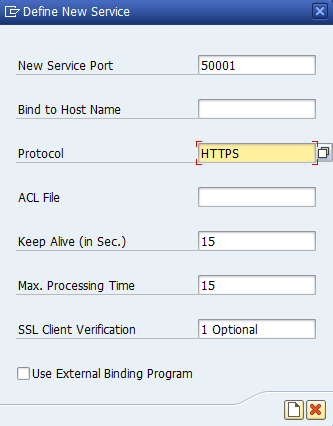 Couple of times I found myself in need of using https protocol in ABAP based NetWeaver system. Sometimes just for basic unit testing to run the test over http is enough. But customers are requiring more and more https as well. There is a nice SAP standard documentation (or here, or here) which basically walks us through the process of setting up an SSL. In cases like it was mine today where I had some of the configuration done and some wasn’t done I choose a kind of shortcut of the whole setup. Basically I realized that my certificates are imported in TA STRUST. So all what I needed to do was an entering a new service in TA SMICM. I went to menu Goto -> Services of the SMICM. Here I went to menu Service and I choose Create item. Notice that once you restart your app server the http won’t work anymore. Basically whole configuration as per SAP documentation needs to be done. Especially we need to maintain system profile parameters to make the changes permanent.